Evidence for the impact of micronutrient supplementation trials on depression in women from developing countries is limited. This study examines this association and compares the impact of weekly versus daily combinations of micronutrient supplements on symptoms of depression. A randomized, positive-controlled trial was conducted in Guatemala. A total of 459 women were assigned randomly to 4 groups to receive weekly (5,000 or 2,800μg) or daily (400 or 200 μg) folic acid (FA) plus iron, zinc and vitamin B-12 for 12 weeks. Depression was measured using the Center for Epidemiologic Studies-Depression 20-item Scale (CES-D). A score=16 was used as an indication of depression. The association between micronutrient status and depression was assessed using baseline data. Generalized linear regression models were used to assess treatment effects. The baseline mean CES-D score was 17.1±8.5 and the prevalence of depression was 49.3%. Women in the lowest tertile of red blood cell folate (RBC) were 1.7 times more likely to be depressed than those in the highest tertile (OR=1.71; 95% CI: 0.91, 3.18). There were no associations between depression and serum folate, homocysteine, vitamin B-12, hemoglobin, ferritin or zinc (p > 0.05). Mean depression scores decreased by 2.3 points post-intervention and depression decreased to 37.7%, with no differences in degree of improvement by group (p = 0.64). Low RBC folate was associated with elevated symptoms of depression at baseline. Supplementation with FA-containing micronutrients may be equally efficacious in improving symptoms of depression when provided daily or weekly. Our findings that poor folate status may increase depression needs to be further investigated. Key words: Depression, folate, micronutrients, randomized controlled trial, women of reproductive age, Guatemala. La evidencia del impacto de ensayos de suplementación con micronutrientes en mujeres con depresión en países en desarrollo es limitada. El presente estudio examina esta asociación y compara el impacto de varias combinaciones de micronutrientes proporcionadas de manera semanal o diaria en los síntomas de depresión, utilizando datos de un ensayo controlado (control positivo) y aleatorizado realizado en Guatemala. Un total de 459 mujeres fueron asignadas al azar entre cuatro grupos para recibir semanalmente (5.000 o 2.800 μg) o diariamente (400 o 200 μg) de ácido fólico (AF) combinado con hierro, cinc y vitamina B-12 durante 12 semanas. La depresión fue medida utilizando la escala de 20 ítems del Centro de Estudios Epidemiológicos de la Depresión (CES-D). Un puntaje =16 fue considerado indicativo de depresión. Se evaluó la asociación entre el nivel de micronutrientes en sangre y depresión utilizando datos provistos por la línea de base. Se utilizaron modelos de Regresión Linear Generalizada para evaluar los efectos del tratamiento. La media del puntaje de la línea de base CES-D fue de 17,1±8,5 y la prevalencia de depresión fue del 49,3%. Las mujeres en el tercil más bajo del folato eritrocitario presentaron 1,7 veces más probabilidades de estar deprimidas que aquellas en el tercil más alto (OR=1,71; 95% CI: 0,91, 3,18). No se encontró asociación entre depresión y folato sérico, homocisteína, vitamina B-12, hemoglobina, ferritina sérica o cinc (p>0,05). Los puntajes de depresión medios post-intervención disminuyeron en 2.3 puntos y la depresión se redujo a 37,7%, sin presentar diferencias en el grado de mejoría por grupo (p=0,64). En síntesis, el bajo nivel de folato eritrocitario se asoció a síntomas elevados depresivos en la línea de base. La suplementación con AF sumado a otros micronutrientes puede ser igualmente eficaz en la mejora de síntomas depresivos cuando provista diaria o semanalmente. Nuestros resultados sugieren que bajos niveles de folato eritrocitario incrementan la depresión, pero esta afirmación requiere del desarrollo de futuras investigaciones. Palabras clave: Depresión, folato, micronutrientes, experimentos aleatorizados, mujeres en edad reproductiva, Guatemala. Depression is a significant public health problem in both developed and developing countries, affecting 10-25% of women of reproductive age (1 ). Depression is one of the leading causes of disease-related disability for women (2 ) and also has adverse effects on birth outcomes, parenting and child development (3 ,4 ). There is some evidence that micronutrient deficiencies – particularly iron, zinc, vitamin B-12 and folate – may be linked to depression. Iron deficiency has been shown to affect neurotransmitter synthesis (5 ) and is associated with depression in postpartum women (6 ,7 ). Zinc deficiency has also been associated with depression in cross-sectional (8 ), case-control studies (9 ,10 ) and small trials (11 ,12 ). Various sources suggest an association between folate levels and depression. Clinical studies report higher risk of major depression, greater severity of depression (13 ,14 ), and decreased response to anti-depressants (15 ,16 ) among patients with low folate status. At the community level, some crosssectional study findings suggest an association between low folate levels and increased risk of depression (17 - 18 19 20 21 22 ). Other findings reported an association in middle-aged women, but not in elderly women or men (23 ) or no evidence of a relationship (24 ). Low dietary folate intake was found to increase risk for depression in Finnish and Japanese men (25 ,26 ) but not in women (26,27 ). Folate deficiency also leads to elevated homocysteine (Hcy) which has been associated with depression in some (17,21-23,28 ) but not all studies(18,20,24). Lastly, several controlled trials in patients with symptoms of depression show that combining antidepressant medication with FA enhances therapeutic effects (29 -30 31 32 ). A placebo-controlled trial of FA supplementation (100 μg/d for 6 weeks followed by 200 μg/d for a further 6 weeks) carried out in healthy Irish men found no effect but the study was underpowered (n=23) (33 ). Evidence of the relationship between vitamin B-12 and depression are mixed; some studies show an inverse relationship (22,24,34 ), while others report no association (23). An RCT of folate, B-12 and B-6 in Australian women found no effects on mood (35 ). Folate and vitamin B-12 may be involved in the pathology of depression through three main mechanisms: 1) folate and vitamin B-12 play a critical role in the methylation pathways which can influence the synthesis and metabolism of neurotransmitters (36 ); 2) low folate status leads to increased Hcy concentrations, and elevated Hcy can generate reactive oxygen species, promoting oxidative stress (14) which may contribute to vascular injury and cerebral dysfunctions; and 3) low folate status influences the rate of synthesis of tetrahydrobiopterin (BH4), a cofactor in the hydroxylation of phenylalanine and tryptophan, which are necessary for the synthesis of dopamine and serotonin (14), both shown to be involved in the etiology of depression. Studies in Guatemala show a high prevalence of micronutrient deficiencies. Anemia is prevalent, especially in women of rural and indigenous populations (37 ). Zinc deficiency is presumed to be a common problem due to diets high in phytate (38 ) and low in animal protein (39 ). Low vitamin B-12 levels have also been reported (40 ). Finally, the country’s high incidence of neural tube defects (41 ,42 ) suggest significant folate deficiency, though there are no national folate deficiency data. Assess the association between micronutrient status (folate, vitamin B-12, Hcy, iron and zinc) and symptoms of depression. Compare the impact of weekly versus daily supplements containing FA and other micronutrients on symptoms of depression. The study was approved by the Ethical Committee of the Hospital Roosevelt, Guatemala City, Guatemala and Emory University’s Institutional Review Board, Atlanta, Georgia, USA. Written informed consent was obtained from every participant. The results reported here are from a randomized controlled trial (RCT) designed to assess the impact of supplementation with different doses of weekly versus daily FA plus other micronutrients on folate status. The study design, trial profile and characteristics of the study sample have been described in detail elsewhere (43 ). Briefly, 459 healthy women aged 15-49 years were recruited from Concepción, Chiquirichapa, in the western highlands of Guatemala. Women who were pregnant, lactating (having had a child within the last three month), consuming FA supplements, diagnosed with a chronic disease that interferes with FA metabolism, or severely anemic (Hb < 70 g/L) were not admitted into the study. Women with severe anemia were provided 90 tablets containing 120 mg of iron for daily use and referred to the local health clinic. All women eligible for inclusion into the study were assigned randomly to receive one of four supplements: 1) 5000 μg FA+120 mg iron+30 mg Zn + 16.8 mcg B-12/week 2) 2800 μg FA+120 mg iron+16.8 mcg B-12/week 3) 400 μg FA+ 60 mg iron+ 15 mg Zn + 2.4 mcg B-12/day, and 4) 200 μg FA+ 60 mg iron+2.4 mcg B-12/day (Table 1). Supplementation lasted 12 weeks, between March and June 2006. Trained field workers from the community visited each woman 7 days a week to deliver and observe supplement ingestion for the entire 12-wk period. All women received 7 pills /week. The weekly dose groups received 1 active pill on the 3rd day of the week and placebo on the other 6 days. 422 women completed the trial, with no differences in loss to follow up by group. Assessment of symptoms of depression: The presence of symptoms of depression was assessed pre- and postsupplementation using the Center for Epidemiologic Studies Depression Scale (CES-D scale) (44 ). The CES-D scale is a self-reported 20-item checklist measuring symptoms of depression in the general population. Each question is scored on a scale of 0-3, yielding a range of possible scores of 0 to 60, with higher scores indicating increased severity of depression. A score = 16 is considered to be indicative of a significant level of symptoms of depression (44); here we refer to scores = 16 as indicating “depression”. Women receiving scores = 16 were referred to the attending psychologist at the local health clinic. Several studies have adapted this instrument for use with Spanish-speaking populations, confirming the high validity and reliability of this measure (45 ,46 ). The CES-D was translated to Mam, the community’s indigenous language, and checked for accuracy through back translation. Biochemical indicators of micronutrient status: Afinger-prick capillary blood sample was obtained to measurehemoglobin (Hb) concentrations using a B-Hemoglobinanalyzer (Hemocue). Venous blood samples were collectedafter overnight fasting at baseline and post-intervention.Venous blood was centrifuged at 1500 x g for 10 minutes at4oC. The serum was separated and stored at -700C at theInstitute of Nutrition of Central America and Panama (INCAP)in Guatemala City until analysis at the National Institute ofPublic Health, Cuernavaca, Mexico. Serum and RBC folatewere determined by microbiological assays (47 ). Serum Hcywas measured by HPLC and fluorescence detection (48 ).Serum vitamin B-12, ferritin and C-reactive protein (CRP)were determined using a Nefelometric immunoassay reactivekit (Behring Diagnostics Inc.) (49 ). Serum zinc was measuredby standard method with flame atomic absorptionspectrophotometry (PerkinElmer Life And AnalyticalSciences, Inc.) (50 ). Dietary intakes were collected at baseline using a semiquantitative food frequency questionnaire (FFQ) developed by INCAP. This FFQ was shown to be valid for use in Guatemalan adults (51 ), and was adapted by INCAP for use in the Mam indigenous region. Other characteristics: Participants were interviewed at baseline for information on their demographic background, level of education, current marital status, reproductive history, and health status. Socio-economic status (SES) was assessed using a questionnaire that included questions related to household size, occupation and education, water and sanitation, and household possessions. Morbidity data were collected using a questionnaire with 22 questions about symptoms in the last month, including gastrointestinal discomfort headache, fatigue, dizziness and fever. Body weight and height were measured to the nearest 0.1 kg or cm, respectively, and body mass index (BMI) was calculated as weight in kg over height in meters squared. All interviewers were bilingual in Mam and Spanish and well-trained in interviewing techniques, ethical issues and administration of the questionnaires and standardized measurement techniques. Interviews were conducted in Mam or Spanish as appropriate. Among 459 women randomized for inclusion into the study, 37 women withdrew from the study due to several reasons, including pregnancy (n = 6), relocation (n = 4), time constraints (n = 3), disapproval of participation from relatives (n = 4), gastric discomfort or other side effects (n=6), and hospitalization due to other non-supplementation related health problems (n = 6). Those not continuing in the study had similar socio-economic and anthropometric characteristics as those who completed the study (p > 0.05, results not shown). Of the 422 participants completing the study, 370 (88%) provided both baseline and endline blood samples and are included in our analyses; 52 women refused to give blood at the end of intervention. Subjects included in the analyses had similar baseline characteristics to those not included in the analyses (P > 0.05, results not shown). Statistical analyses were performed on data from 369 subjects who provided both baseline and endpoint blood samples. Data were checked for normal distribution using the Kolmogorow-Smirnov test. SES index and morbidity scores were created using a principal component analysis according to the method used in previous INCAP studies (52 ). Baseline data were used for assessing the relationship between micronutrient status and symptoms of depression. Differences in the characteristics between depressed and non-depressed groups were examined by the Student’s t test, the Mann-Whitney U test or the chi-square test. Subjects were also divided into tertiles according to their micronutrient status. Logistic regression models were used to assess associations between micronutrient status and symptoms of depression, controlling for potential confounding by age, education, marital status, SES, morbidity and number of pregnancies. In order to assess the efficacy of supplementation, the baseline characteristics across treatment groups were compared using the ANOVA, Kruskal-Wallis test or the chisquared analyses. The effect of treatment on depression was assessed by using a generalized linear regression model (SAS Proc Mixed procedures) (53 ). All statistical tests were twosided and significance was reported for p-values < 0.05. Of the 20 items in the scale, 16 assess negative symptoms of depression and are scored on a scale of 0 to 3. Four of the items (4, 8, 12 and 16) assess positive symptoms and therefore the coding is reversed (3 to 0). Because of possible scaling problems with items 4 and 8, an 18-item modified scale has been proposed (54 ). The commonly used cut-off point for identifying a higher level of depression is =16 but higher cut off points (= 22 or 24) have been used (55 ,56 ). To account for these differences, we repeated all analyses using the modified 18-item scale and a cut-off point of = 24 to see if results were consistent with the main analyses (original 20-item scale and cut-off point of =16). The characteristics of the study population stratified by baseline depression score are presented in Table 2. Nearly half of the subjects (49.3 %) had CES-D scores =16. Compared to non-depressed women, depressed women were significantly older (p = 0.001), had fewer years of schooling (p = 0.03), were more likely to be single, divorced or widowed (p = 0.02), were more likely to have a poor morbidity score (p < 0.01), and to have more pregnancies (p = 0.002). 2 Student t test for continuous variables that are normally distributed (age, education, body mass index, hemoglobin, serum and RBC folate and serum zinc). Mann Whitney U test for continuous variables that are non-normally distributed (number of pregnancy, serum ferritin, Hcy, vitamin B-12). Chi-square test for categorical variables. Women with and without depression did not differ in terms of any of the biochemical measures expressed as continuous variables (Table 2). Adjustment for age, education, marital status, morbidity scores, number of pregnancies and SES did not change the results. 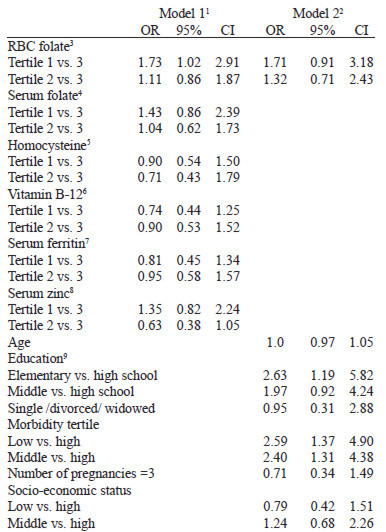 However, when micronutrient concentrations were divided into tertiles, depression was more common among participants in the lower tertile of RBC folate compared to the highest (Table 3). In the univariate analysis (Model 1), depression was 1.73 (95% CI: 1.02, 2.91) times more likely among women whose RBC folate concentrations were in the lowest tertile than among those with RBC folate concentrations in the highest tertile. Similarly, depression was also more likely among those in the lowest tertile of serum folate than among those in the middle tertile but this association was not significant (OR=1.43; 95% CI: 0.86, 2.39). In the multivariate analysis for RBC folate adjusted for age, marital status, morbidity scores, number of pregnancies, SES and education (Model 2), the odds were similar to those in the unadjusted model but no longer statistically significant (OR=1.71; 95% CI: 0.91, 3.18). No significant associations were found in any of the multivariate models between symptoms of depression and serum folate, Hcy, vitamin B-12, serum ferritin or serum zinc. Lower education and poorer morbidity scores, but not marital status, number of pregnancies or SES, were significantly associated with depression in multivariate models. 9Education is categorized as elementary school (less than 6 y schooling), middle school (6-9 y) and high school (= 10 y). SES status and morbidity scores was defined as high, middle or low based on tertiles. Education, SES and morbidity were each expressed as two dummy variables that left “high” as the reference category: low (low = 1, otherwise 0) and middle (middle=1, otherwise 0). Selected baseline characteristics including age, education, anthropometric measurements, marital or SES status, dietary intakes and biochemical indicators were not significantly different across the four treatment groups, as shown in Table 4 (43). Table 4 also shows the CES-D scores and the proportion of women with depression pre- and post-supplementation. The mean baseline score was 17.0 ± 8.5, with no significant differences among the four treatment groups (p = 0.53). At the end of supplementation, depression scores were reduced significantly within groups in all 4 group (p < 0.001), but the changes did not differ among the groups (p = 0.95). Overall, mean depression scores decreased by 2.3 points (95% CI -3.1, -1.4). At baseline, 49.3% of women were depressed; this was reduced to 37.7% after supplementation, with no significant differences in the extent of improvement across groups (p = 0.64). There was a negative correlation between reduction of symptoms of depression and baseline CES-D scores (r = -0.47, p < 0.001). Women with high initial depression scores (CESD =16) showed significant improvement with a mean decrease of 5.4 points (95% CI: -6.7, -4.1), while the change in women with low depression scores was not statistically significant (0.7 points; 95% CI: -0.1, 1.58). Analyses using a modified 18-item scale and a cut-off point of = 24 showed an improvement in all four groups (results not shown). The level of depression decreased from 14.1 to 8.8 (95% CI: -9.8, -0.6) from baseline to 12 weeks and the average difference in mean scores was -2.3 (95% CI: -3.1, -1.5). The comparison between tertile 1 vs. 3 (model 1) of the baseline distribution of RBC folate suggested a doubling of the risk of depression (OR = 2.10, 95% CI 0.93, 4.74) ; the corresponding comparison between tertile 2 vs. 3 suggested a slightly stronger relationship (OR = 2.48, 95% CI 1.12, 5.52). To our knowledge this is the first RCT to examine effects of micronutrient supplements on depression in women from developing countries. Nearly half of the women in our study had high levels of symptoms of depression (49.3%), a finding consistent with two other studies among women in rural Mexico (57 ,58 ). Because of possible cultural bias, the extent of depression defined using clinical criteria may differ and our population estimates need to be interpreted with caution. We found that women in the lowest RBC folate tertile had a significant risk of depression 1.7 times greater than that of women in the highest tertile of RBC folate; this relationship disappeared after adjustment for potentially confounding factors although the magnitude remained unchanged. Contrary to some reports in the literature, no associations with depression were found for serum folate, Hcy, vitamin B-12, serum ferritin or serum zinc. RBC folate is a better, more stable “longer term” indicator of folate status than serum folate because the latter fluctuates with recent folate intake; this may explain the suggestion from our study of an association between RBC folate but not serum folate and depression. Additionally, discrepancies among studies may be due to the differences in study populations and in the instruments used to assess symptoms of depression. The current study explored the efficacy of weekly versus daily FA plus other micronutrients on micronutrient status as well as depression. RBC folate measures were unavailable for the endpoint, but measures of change were available for serum folate and Hcy. The findings indicate that folate status was similarly improved by all four combinations of daily and weekly micronutrients, as reported elsewhere (43). The overall mean of serum folate concentrations increased by 15.4 nmol/L (95% CI: 13.8, 16.9), and the overall geometric mean of Hcy levels decreased by 9.8% (95% CI: -12.3, -7.1). There were differences in impact between weekly and daily supplementation for B-12 and ferritin levels. Daily supplementation improved serum B-12 by 20% (95% CI: 8, 33.2) while weekly supplementation had no significant impact (43). Changes in serum ferritin were significantly higher for daily compared to weekly supplemented groups [31.7 μg/L (95% CI: 26.8, 36.6) vs. 7.6 μg/L (95% CI: 2.8, 12.4)]. No differences in Hb or serum zinc were found postsupplementation (59 ). A recent study by Rosenthal et al (60 ) is consistent with our results that weekly is as efficacious as daily FA supplementation in improving folate status. In a twoarm randomized clinical trial conducted in Honduran women, both daily and weekly FA supplementation significantly increased serum and RBC folate levels but supplementation with a daily dose of 1000 μg led to a larger and more rapid increase in both serum and RBC folate levels from baseline to endpoint than weekly supplementation with 5000 μg (60). Our study was a well-conducted RCT in a community sample of women of reproductive age in a developing country, where the extent of micronutrient deficiencies is high. Implementation of the study was careful and rigorous, from the training of the interview team to the supervision of the supplementation, to ensure high-quality data. Our study had two weekly and two daily supplement regimens and, compared to baseline measures, all four groups improved equally in folate status (43). As shown in Table 4, all four groups also showed similar levels of improvement in depression scores. The overall mean of the depression scores decreased by 2.3 points and the prevalence of depression had significantly reduced from 49.3% to 37.7%. Thus, one interpretation of our findings is that improvements in folate status, which were similar in all four groups, caused improvements in depression of an equal magnitude across all groups. However, our study has important limitations and other explanations are possible. Without a placebo control group, we cannot be certain that the improvement in symptoms of depression was due solely to the supplementation. We cannot exclude the possibility, however unlikely, that factors affecting depression improved in the community coincidentally with the beginning of supplementation. Also, without a placebo group, we cannot exclude the possibility of bias created by asking about the presence of symptoms of depression twice, at the beginning and end of the study. Specifically, we do not know whether familiarity with the CES-D instrument altered responses at the end of supplementation 12 weeks later. Finally, we cannot exclude a possible beneficial effect on symptoms of depression produced by the interaction between our research personnel and the study women over the course of the study. Future studies should consider including a placebo group. Even if supplementation caused the improvements in depression, our study would not be able to attribute this unequivocally to FA because the supplements also contained other micronutrients. Zinc would be an unlikely cause because the improvement in symptoms of depression was similar in the groups with or without zinc. The role of iron is unclear. While changes in ferritin levels were greater in daily versus weekly groups, depression improved similarly across all groups; also, hemoglobin levels were not impacted by supplementation in any group (59). B-12 levels improved only in those receiving daily supplementation making B-12 an unlikely explanation. Thus, the most likely mechanism for an effect due to supplementation is the improvement in folate status that was similar in all four groups, suggesting that all four groups provided doses that met the physiological need for folate. The possible role of folate is supported by the association between low RBC folate levels at baseline and depression and by the lack of such associations with the other micronutrients. Sensitivity analyses using a modified 18-item scale and a stricter definition of depression (=24) showed qualitatively similar results as those obtained using the original 20-item scale and the commonly used cut-off point of = 16. In conclusion, weekly supplementation with FA plus other micronutrients was apparently equally effective as daily supplementation in improving folate status and may explain the improvement in symptoms of depression in Guatemalan women of reproductive age. Because a placebo control was not included, the possibility that factors other than supplementation caused these improvements cannot be excluded. Further studies are needed to isolate the specific impact of FA on depression. We would like to express our sincere thanks to Dr. Luis Ramirez and Dr. Manuel Ramirez of INCAP for technical support, Vilma Gonzalez for coordination of the field work, the field workers who collected the data, and the women of the village of Concepcion, for their participation in the study. Coppen A, Bolander-Gouaille C. Treatment of depression: time to consider folic acid and vitamin B12. J Psychopharmacol. 2005;19:59-65. Murray CJL, Lopez AD. Global Burden of Disease: A comprehensive assessment of mortality and disability from diseases, injuries, and risk factors in 1990 and projected to 2020. Vol. 1 of The Global Burden of Disease and Injury: Cambridge, Mass: Harvard School of Public Health; 1996. Beck CT. The effects of postpartum depression on child development: a meta-analysis. Arch Psychiatr Nurs. 1998;12:12-20. Orr ST, Miller CA. Maternal depressive symptoms and the risk of poor pregnancy outcome. Review of the literature and preliminary findings. Epidemiol Rev. 1995;17:165-71. Beard JL, Connor JR. Iron status and neural functioning. Annu Rev Nutr. 2003;23:41-58. Corwin EJ, Murray-Kolb LE, Beard JL. Low hemoglobin level is a risk factor for postpartum depression. J Nutr. 2003;133:4139-42. Beard JL, Hendricks MK, Perez EM, Murray-Kolb LE, Berg A, Vernon-Feagans L, et al. Maternal iron deficiency anemia affects postpartum emotions and cognition. J Nutr. 2005;135:267-72. Wojcik J, Dudek D, Schlegel-Zawadzka M, Grabowska M, Marcinek A, Florek E, et al. Antepartum/postpartum depressive symptoms and serum zinc and magnesium levels. Pharmacol Rep. 2006;58:571-6. Maes M, D’Haese PC, Scharpe S, D’Hondt P, Cosyns P, De Broe ME. Hypozincemia in depression. J Affect Disord. 1994;31:135-40. McLoughlin IJ, Hodge JS. Zinc in depressive disorder. Acta Psychiatr Scand. 1990;82:451-3. Katz RL, Keen CL, Litt IF, Hurley LS, Kellams-Harrison KM, Glader LJ. Zinc deficiency in anorexia nervosa. J Adolesc Health Care. 1987;8:400-6. Su JC, Birmingham CL. Zinc supplementation in the treatment of anorexia nervosa. Eat Weight Disord. 2002;7:20-2. Abou-Saleh MT, Coppen A. Serum and red blood cell folate in depression. Acta Psychiatr Scand. 1989;80:78-82. Bottiglieri T, Hyland K, Laundy M, Godfrey P, Carney MW, Toone BK, et al. Folate deficiency, biopterin and monoamine metabolism in depression. Psychol Med. 1992;22:871-6. Fava M, Borus JS, Alpert JE, Nierenberg AA, Rosenbaum JF, Bottiglieri T. Folate, vitamin B12, and homocysteine in major depressive disorder. Am J Psychiatry. 1997;154:426-8. Papakostas GI, Petersen T, Mischoulon D, Ryan JL, Nierenberg AA, Bottiglieri T, et al. Serum folate, vitamin B12, and homocysteine in major depressive disorder, Part 1: predictors of clinical response in fluoxetine-resistant depression. J Clin Psychiatry. 2004;65:1090-5. Kim JM, Stewart R, Kim SW, Yang SJ, Shin IS, Yoon JS. Predictive value of folate, vitamin B12 and homocysteine levels in late-life depression. Br J Psychiatry. 2008;192:268-74. Morris MS, Fava M, Jacques PF, Selhub J, Rosenberg IH. Depression and folate status in the US Population. Psychother Psychosom. 2003;72:80-7. Ramos MI, Allen LH, Haan MN, Green R, Miller JW. Plasma folate concentrations are associated with depressive symptoms in elderly Latina women despite folic acid fortification. Am J Clin Nutr. 2004;80:1024-8. Sachdev PS, Parslow RA, Lux O, Salonikas C, Wen W, Naidoo D, Christensen H, Jorm AF. Relationship of homocysteine, folic acid and vitamin B12 with depression in a middle-aged community sample. Psychol Med. 2005;35:529-38. Dimopoulos N, Piperi C, Salonicioti A, Psarra V, Gazi F, Papadimitriou A, Lea RW, Kalofoutis A. Correlation of folate, vitamin B12 and homocysteine plasma levels with depression in an elderly Greek population. Clin Biochem. 2007;40:604-8. Tiemeier H, van Tuijl HR, Hofman A, Meijer J, Kiliaan AJ, Breteler MM. Vitamin B12, folate, and homocysteine in depression: the Rotterdam Study. Am J Psychiatry. 2002;159:2099-101. Bjelland I, Tell GS, Vollset SE, Refsum H, Ueland PM. Folate, vitamin B12, homocysteine, and the MTHFR 677C = T polymorphism in anxiety and depression: the Hordaland Homocysteine Study. Arch Gen Psychiatry. 2003;60:618-26. Penninx BW, Guralnik JM, Ferrucci L, Fried LP, Allen RH, Stabler SP. Vitamin B (12) deficiency and depression in physically disabled older women: epidemiologic evidence from the Women’s Health and Aging Study. Am J Psychiatry. 2000;157:715-21. Tolmunen T, Hintikka J, Ruusunen A, Voutilainen S, Tanskanen A, Valkonen VP, Viinamaki H, Kaplan GA, Salonen JT. Dietary folate and the risk of depression in Finnish middleaged men. A prospective follow-up study. Psychother Psychosom. 2004;73:334-9. Murakami K, Mizoue T, Sasaki S, Ohta M, Sato M, Matsushita Y, Mishima N. Dietary intake of folate, other B vitamins, and omega-3 polyunsaturated fatty acids in relation to depressive symptoms in Japanese adults. Nutrition. 2008; 24(2):140-7. Miyake Y, Sasaki S, Tanaka K, Yokoyama T, Ohya Y, Fukushima W, Saito K, Ohfuji S, Kiyohara C, Hirota Y. Dietary folate and vitamins B12, B6, and B2 intake and the risk of postpartum depression in Japan: the Osaka Maternal and Child Health Study. J Affect Disord. 2006;96:133-8. Tolmunen T, Hintikka J, Voutilainen S, Ruusunen A, Alfthan G, Nyyssonen K, Viinamaki H, Kaplan GA, Salonen JT. Association between depressive symptoms and serum concentrations of homocysteine in men: a population study. Am J Clin Nutr. 2004;80:1574-8. Coppen A, Bailey J. Enhancement of the antidepressant action of fluoxetine by folic acid: a randomised, placebo controlled trial. J Affect Disord. 2000;60:121-30. Coppen A, Chaudhry S, Swade C. Folic acid enhances lithium prophylaxis. J Affect Disord. 1986;10:9-13. Godfrey PS, Toone BK, Carney MW, Flynn TG, Bottiglieri T, Laundy M, Chanarin I, Reynolds EH. Enhancement of recovery from psychiatric illness by methylfolate. Lancet. 1990;336(8712):392-5. Passeri M, Cucinotta D, Abate G, Senin U, Ventura A, Stramba Badiale M, Diana R, La Greca P, Le Grazie C. Oral 5'-methyltetrahydrofolic acid in senile organic mental disorders with depression: results of a double-blind multicenter study. Aging (Milano). 1993;5:63-71. Williams E, Stewart-Knox B, Bradbury I, Rowland I, Pentieva K, Helander A, McNulty H. Effect of folic acid supplementation on mood and serotonin response in healthy males. Br J Nutr. 2005;94:602-8. Baldewicz TT, Goodkin K, Blaney NT, Shor-Posner G, Kumar M, Wilkie FL, Baum MK, Eisdorfer C. Cobalamin level is related to self-reported and clinically rated mood and to syndromal depression in bereaved HIV-1(+) and HIV-1(-) homosexual men. J Psychosom Res. 2000;48:177-85. Bryan J, Calvaresi E, Hughes D. Short-term folate, vitamin B-12 or vitamin B-6 supplementation slightly affects memory performance but not mood in women of various ages. J Nutr. 2002;132:1345-56. Bottiglieri T. Homocysteine and folate metabolism in depression. Prog Neuropsychopharmacol Biol Psychiatry. 2005;29:1103-12. Marini A, Gragnolati M. Malnutrition and Poverty in Guatemala Technical Paper No. 6. World Bank. ; 2003. Sandstrom B, Sandberg AS. Inhibitory effects of isolated inositol phosphates on zinc absorption in humans. J Trace Elem Electrolytes Health Dis. 1992;6:99-103. Fitzgerald SL, Gibson RS, Quan de Serrano J, Portocarrero L, Vasquez A, de Zepeda E, Lopez-Palacios CY, Thompson LU, Stephen AM, Solomons NW. Trace element intakes and dietary phytate/Zn and Ca x phytate/Zn millimolar ratios of periurban Guatemalan women during the third trimester of pregnancy. Am J Clin Nutr. 1993;57:195-201. Casterline JE, Allen LH, Ruel MT. Vitamin B-12 deficiency is very prevalent in lactating Guatemalan women and their infants at three months postpartum. J Nutr. 1997;127:1966-72. Cifuentes G. Perfil epidemiológico de las anomalías del tubo neural en Guatemala, Enero-Diciembre de 2000 [Undergraduate Graduation Thesis]: School of Medicine. Universidad San Carlos de Guatemala; 2002. Acevedo CR, Anzueto ER, Mendez AG, Ramirez FM. Prevalencia de anomalías congénitas mayores externas, en recién nacidos atendidos en hospitales nacionales y regionales de Guatemala. (Durante el periodo comprendido del año 2001 al 2003) [Undergraduate Graduation Thesis]: School of Medicine. Universidad de San Carlos de Guatemala, Guatemala; 2004. Nguyen P, Grajeda R, Melgar P, Marcinkevage J, Flores R, Martorell R. Weekly may be as efficacious as daily folic acid supplementation in improving folate status and lowering serum homocysteine concentrations in guatemalan women. J Nutr. 2008;138:1491-8. Soler J, Perez-Sola V, Puigdemont D, Perez-Blanco J, Figueres M, Alvarez E. [Validation study of the Center for Epidemiological Studies-Depression of a Spanish population of patients with affective disorders]. Actas Luso Esp Neurol Psiquiatr Cienc Afines. 1997;25:243-9. Masten WG, Caldwell-Colbert AT, Alcala SJ, Mijares BE. Reliability and validity of the Center for Epidemiology Studies Depression Scale. Hispanic Journal of Behavioral Sciences. 1986;8:77-84. Tamura T, editor. Microbiological assay of folates in Folic acid metabolism in health and disease. New York: John Wiley & Sons, Inc.; 1990. Araki A, Sako Y. Determination of free and total homocysteine in human plasma by high-performance liquid chromatography with fluorescence detection. J Chromatogr. 1987;422:43-52. CDC. US Department of Health and Human Services CDC. Biosafety in Microbiological and Biomedical Laboratories, HHS Publication (CDC) 93-8395, Section II, 1999. p. 8-16. Perkin Elmer Instruments U. Analytical Methods for Atomic Absorption Spectrometry; 2000. p.160. Rodriguez MM, Mendez H, Torun B, Schroeder D, Stein AD. Validation of a semi-quantitative food-frequency questionnaire for use among adults in Guatemala. Public Health Nutr. 2002;5:691-9. Maluccio J, Murphy A, Yount K. Research note: A socioeconomic index for the INCAP longitudinal study 1969-77. Food Nutr Bull. 2005;26:S120-4. Kung-Yee L, Scott L, Zeger. Longitudinal data analysis using generalized linear models. Biometrika. 1986;73:13-22. Stanford Patient Education Research Center. Spanish Center for Epidemiologic Studies Depression Scale (CES-D). http://patienteducation.stanford.edu/research/cesdesp.html. Chiu S, Webber MP, Zeig-Owens R, Gustave J, Lee R, Kelly KJ, et al. Validation of the Center for Epidemiologic Studies Depression Scale in screening for major depressive disorder among retired firefighters exposed to the World Trade Center disaster. J Affect Disord; 2009. Harlow BL, Cohen LS, Otto MW, Spiegelman D, Cramer DW. Prevalence and predictors of depressive symptoms in older premenopausal women: the Harvard Study of Moods and Cycles. Arch Gen Psychiatry. 1999;56(5):418-24. Fleischer NL, Fernald LC, Hubbard AE. Depressive symptoms in low-income women in rural Mexico. Epidemiology. 2007;18:678-85. Peralta-Pedrero ML, Mercado-Castelazo E, Cruz-Avelar A, Sanchez-Marquez O, Lemus-Rocha R, Martinez-Garcia M del C. [Depression prevalence and risk factors found in women attended by a family physician]. Revista medica del Instituto Mexicano del Seguro Social. 2006;44:409-14. Nguyen PH. The effects of daily versus weekly folic acid supplementation on biochemical and functional status of reproductive age women in rural Guatemala. A doctoral thesis submitted to the Graduate School of Art and Sciences: Emory University; 2008. Rosenthal J, Milla G, Flores A, Yon M, Pfeiffer C, Umana E, Skerrette N, Barahona F. Effect of different dosage and administration schedules of folic acid on blood folate levels in a population of Honduran women of reproductive age. Public Health Nutr. 2008;11:822-30.